Everyone knows the most important film for conveying the traditional messages of Christmas values and violent vigilantism is Home Alone. It’s the film that inspired a generation of kids to try and bunk off from family holidays and to take the law into their own hands when faced with bumbling burglars. So, as we all head back to our homes for the festive period and attach car batteries to door handles just to be safe, we’re super-hyped to find out Macaulay Culkin has re-shot scenes from Home Alone for a commercial because it brings back memories of Christmas, when the world wasn’t such a complicated place. I won’t hold it against you if you were born before 1990. Back then Christmas was a simpler time of TV specials, no mobile phones, and a distinct lack of dinner table fallouts about Brexit/Trump (delete as applicable). In fact, I’m pretty sure I used to get excited about Christmas morning. The not getting to sleep. The waking up super early. The banging on my parents’ door to get them up so I could open my presents. Ah what do you know, I’m starting to get a sentimental feeling. 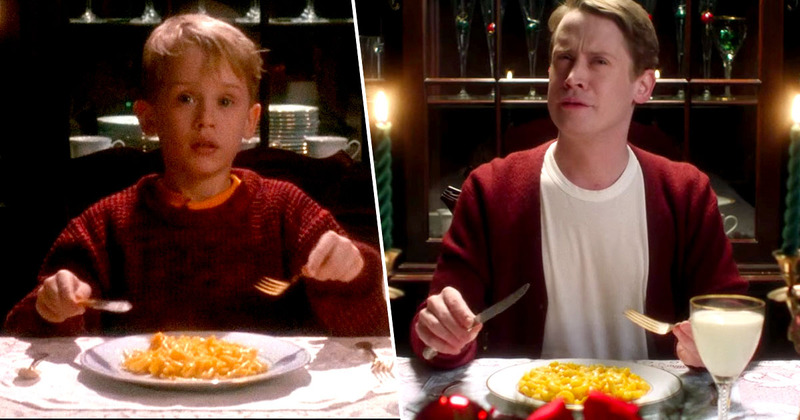 So it’s really cool to relive those moments of my youth – the best ones were always on-screen in made up people’s lives – through the new Google Assistant advert which recreates our favourite Home Alone scenes (except the ones where Harry and Marv get served their justice) with Macaulay Culkin stepping back into the shoes of Kevin McCallister. Now Macaulay’s all grown up he’s not screaming from shock at putting on after shave, instead he’s getting Google to add it to his shopping list. As a big boy, he’s now 38, he knows he needs to clean the sheets from jumping up and down on the bed. And he can see the pizza delivery guy at the door… because of Google. You get the gist.